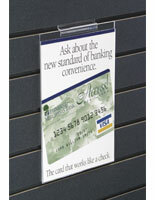 These display frames, slatwall sign holders are designed to fit most slat wall panels. Their universal design allows them to quickly be added to any slatwall fixture or slot wall panel. Slatwall sign holders, also called slot wall signage, feature a lip on the top which slides into the grooves of your slatwall panel with alleviate. 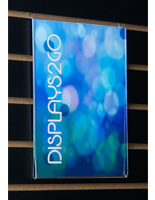 With slatwall sign holders, such as these acrylic poster frames, changing your signage has never been easier. Each slatwall sign holder has an open design, allowing signage to be inserted from the top or from either side. Simply remove your signage and insert your new sign without having to remove the sign holder from the slatwall panel. These slatwall sign holders feature a clear acrylic design, allowing them to quickly blend with any décor or fixture. We manufacture the slatwall sign holders from rugged acrylic to ensure they will withstand years of use. The poster frames, slatwall sign holders are included in our main lucite frames for posters category, giving you a wide variety of other acrylic frames to choose from. 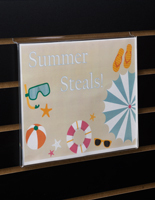 Enclosed poster frames, magnetic picture holders, hanging acrylic frames, and other slatwall sign holders can all be found there. Looking for other types of signholders? We integrate these slatwall sign holders in our main print display selection. 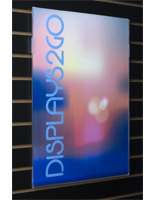 We have hundreds of poster frame options to choose from, allowing you to choose the sign holders that will best suit your display needs. 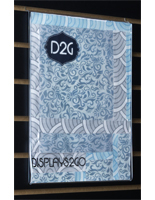 In addition to poster holders, we also have many other point-of-purchase displays in our online catalog. 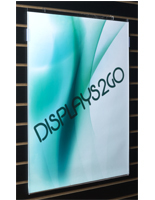 And with most of our display products in stock and ready to ship, you'll have your displays in no time! 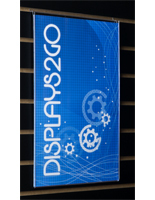 Buy slatwall sign holders online today from Displays2go!